Mark Fromson, founder of LocalSolo, is a freelance digital project manager who works for agencies rather than the end client. Agencies frequently rely on freelancers as a way to gain access to skills they otherwise wouldn’t have, and to be able to grow or shrink their team to meet a changing workload. As a freelancer there can be some advantages to having agencies as clients, such as the possibility of working on larger projects than you’re likely to win on your own, collaborating with a team, and not having to be the one that goes out there and wins the end client. 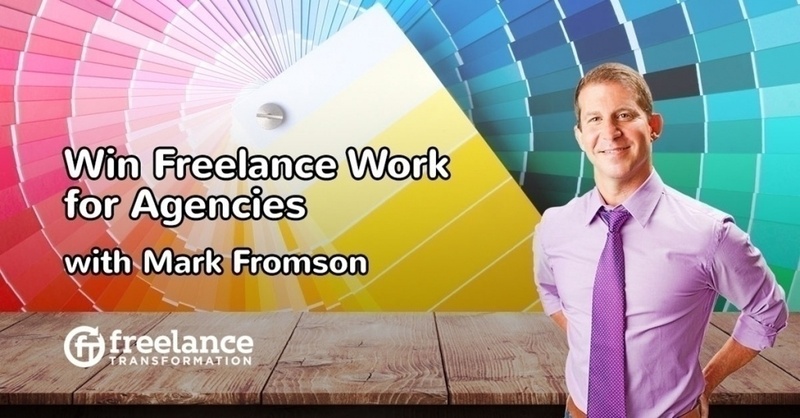 Mark Fromson shares the ins and outs of what agencies are looking for in a freelancer, how to connect with them and build long-term relationships, and the pros and cons of targeting agencies instead of the end client. Agencies are a targeted market and are easy to identify, easy to figure out who to approach for a contract, and easy to figure out who the best agencies are in your area. Agencies are always looking for good freelance contractors. The often need specialists for specific projects, but don’t have enough projects year round to justify a full-time employee, so they hire a contractor. Agencies pay well, pay on time. Get to work with solid people who work at the agency. Get to work with high-end clients. Don’t have to worry about finding your own clients and having to qualify good clients. Once you get known by an agency, there is always more work down the line. Won’t be able to direct all the aspects of the project yourself and dictate the pace and deliverables. Instead, you are part of a team and you can only contribute to the part that you were hired for. You have to be careful which agencies you work with. Make sure the agency has a track record and pays a portion up front. Sometimes agencies will take on freelancers for the sales process to demonstrate to the potential client that they have the talent to do the job, but if they don’t land the project, you get dumped. You want to make sure you get paid for that time too. Helps to have experience with agencies before freelancing for them. Many people first get their taste for agencies by working at an agency for a few years and building up contacts before going out as a freelancer. Brand yourself as yourself, not as some abstract company that can be seen as a competitor. Refer to yourself as an expert in the role that the agency job needs. For example, if the agency is looking for a UI designer, sell yourself as a UI designer, not a brand specialist. Look at the agency’s website. Often the job will be posted. The best way to get into agencies is to get referred in by a staff member who already works there. That means you need to network at meetups and agency events. Figure out who might be able to refer you, such as art directors or project managers. Make sure your online portfolio is up to date and looking good. Take screenshots of your end product, even if you weren’t the designer, but the developer. Most NDAs don’t stop you from using it on your portfolio, so use it about 3 months after the project is live. Get to know 7-8 agencies so you can fill all of your time and get paid well. When you have availability coming up, let the agencies you have worked with know and at least one of them is going to jump on the opportunity to get you on a project. You can work exclusively with one agency for a big project then move on to the next or work with several agencies on different projects all at once. You need to make sure that the projects you work with are a minimum size so you don’t spend all your time project managing. You can bill hourly or charge a fixed fee per project. Try to figure out how much the agency is charging the client so you can make sure that the agency is making a margin above what you are charging them. To figure out the fair price to charge an agency, ask your peers and ask them what you charge. You can also charge by the value that you are providing your client for a fixed rate if you are really good, and can get the work done quickly. Plug and Play. Do as much research as possible about the project before you start so you can hit the ground running. Be proactive and positive. Contribute to the company even after you end the project. Don’t disappear when the project ends and you can get rehired. Try not to get into the company politics or pick sides or get upset if your work is criticized. You really don’t want to have any battles with anyone in the agency because all anyone will remember is that there was friction working with you, even if you were right. Don’t overdo promoting yourself or your friends for more work. Just do the work and do it well and the agency will think of you for future work. A lot of people don’t mean to, but they will try to push their way into things and leave the agency with a bad impression of them.